As it turns out, the elbow to Jarrett Allen’s face in the final minute of a closely contested first half wasn’t the toughest blow to the Brooklyn Nets on Monday night. The Philadelphia 76ers bludgeoned the Nets 51-23 in the third quarter, turning a one-point game at the break into a blowout that saw both teams resting their starters in the final frame. The 51 points were the most by any team in a playoff quarter in more than a half-century and tied the NBA single-quarter playoff record. Elgin Baylor’s 1962 Los Angeles Lakers were the only other team to score that many points in a playoff quarter, doing so in the final frame of Game 5 in a second-round series against the Detroit Pistons. The NBA only had nine teams back then. This time the 51 points came in a crucial Game 2 of a first-round series between third-seeded Philadelphia and sixth-seeded Brooklyn. The Nets pulled off the road upset in the opener, and a knee injury that left 76ers center Joel Embiid a game-time decision had the entire series in doubt. 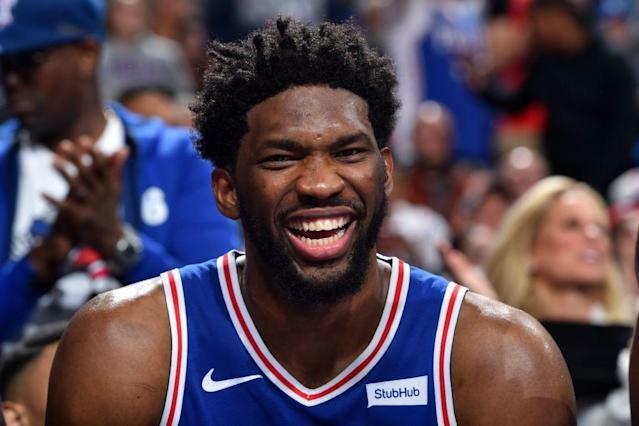 The Sixers responded with a third quarter for the ages and a franchise playoff record for total points in a 145-123 win. It was Embiid who scored the first seven points of the third quarter, en route to a team-high 13 points in the frame. Tobias Harris (12 points) and Mike Scott (10) also scored in double figures in the third. Coming out of the break, Embiid ignited a 21-2 run that pushed Philadelphia’s lead to 20, and Scott’s buzzer-beating bunny capped the 51-point punch that gave the Sixers a 112-87 lead after three quarters. The Sixers emptied their bench two minutes into the fourth quarter. Embiid finished with 23 points and 10 rebounds in 21 minutes, while Ben Simmons submitted his second career playoff triple-double (18 points, 12 assists, 10 rebounds) after a rough Game 1. The series is now tied 1-1 entering Thursday’s Game 3 in Brooklyn. General sentiment from the Sixers locker room is that Brett Brown was the angriest he’s ever been at halftime, specifically about the defensive lapses. It seemed to pay off. Philadelphia’s 145 points in Game 2 broke the franchise playoff record of 141 points, set in by Wilt Chamberlain’s Sixers in an overtime Game 1 of the 1967 NBA Finals. Those 76ers went on to win the title. This group has 15 more wins to go. Per Basketball Reference, the 145 points is also the most by a playoff team since 1992, when the Portland Trail Blazers beat the Phoenix Suns 153-151 in overtime. The 145 points is the most in a regulation playoff game since the Boston Celtics dropped 157 on the New York Knicks in 1990. Boston went on to lose that series.